Go Out Magazine is offering a fleece blanket and wooden bowl as its gift with purchase. Go Out Magazine features products inspired by the great outdoors with everything from ski gear to gas lanterns. The magazine boasts an array of information and graphics on most outdoor activities. How may the fleece blanket and bowl be used as a gift with purchase? The fleece blanket keeps the user warm, especially during cold weather. 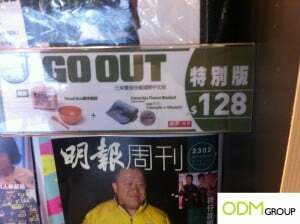 Since Go Out is targetted at readers who are involved in outdoor activities, the fleece blanket may be used when the user is outdoors, such as camping. It will also protect the user from harsh cold weather conditions as it traps heat. The wooden bowl can be used to consume food or drink water when the user is outdoors. It is light, portable and can be carried around easily. The wooden bowl can also be easily cleaned. Both the fleece blanket and the wooden bowl can be branded with Go Out logo on the bowl and fleece. This will increase brand awareness of Go Out magazine and more people will know about it. The logo will also boost brand recall every time the fleece blanket and wooden bowl are used. This will facilitate reminder advertising and readers will be more inclined to buy or subscribe to Go Out magazine as they are reminded about the brand. Moreover, readers will be enticed to buy the magazine in order to get the fleece blanket and bowl for free. Thus, this will increase sales for Go Out magazine.